Wahey! We've just had a letter confirming that Mersey: The river that changed the world will have a stand at the BBC's Big History Show, which takes place at St George's Hall, Liverpool on 14th, 15th and 16th September this year. No doubt we'll have pre-order forms available so that you can reserve your copy of the book, and a special sneak preview of some of the images and audio material that'll be featured. If we're lucky, there could also be a chance to hear from one of the Mersey People themselves, or perhaps Colin, our lovely and intrepid photographer. 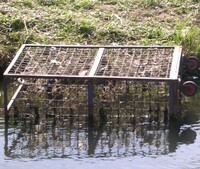 All the Mayors of Lancashire visited the litter trap today and were please to see it removing floating debris. 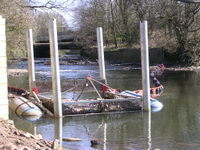 The litter trap installed in Blackburn with Darwen Borough will also improve the look of the catchment downstream as the river flows through Chorley and South Ribble, where Action Darwen Valley intends there will be a concerted effort of river clean ups. At a site visit on Monday the Chairman of Action Darwen Valley (Bruce Bendell) and I discussed how we can remove litter that is already in the River Darwen downstream of the litter trap. We're planning to have a big clean up throughout the catchment, starting from the litter trap downstream and hope to work with local volunteers on the banks. By also involving other partners we should even be able to remove huge items like this unsightly pallet truck, which is silted into the bank just next to the litter trap (how and why these things end up in the river is beyond me!). Interesting issue came up today on a site visit in Frodsham. I was out with BTCV assessing a site for a potential hedge planting & hedge laying scheme. One of our problems is the number of old crack willows, some of which are dangerous. BTCV suggested I contact Chester zoo as they are on the look out for willow for their giraffes! I can't wait to look into that one. Hopefully some good PR is coming our way. See the Darwen litter trap in action! The Litter Trap is complete! Yesterday was most exciting - seeing the litter trap working properly and being emptied for the very first time. Tomorrow I am showing the trap to the Mayors of Lancashire and have made a small flier (attached) about it and how it works.